Medical Devices must adhere to strict EMC testing standards to ensure proper product operation and interaction with other devices both medical and non-medical. In the United States, medical devices must meet Food and Drug Administration (FDA) standards. 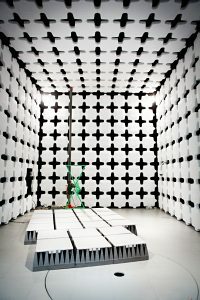 In Europe, the requirements include the Medical Devices Directive and IEC 60601-1-2, which are the recognized standards for testing electromagnetic compatibility of medical devices. It is important to note that in addition to EN 60601, there are dozens of additional standards that address unique features and characteristics of medical devices. In assessing the EMC test requirements of a medical device, it is important to understand the definitions of medical device and accessory. control of conception, and which does not achieve its principal intended action in or on the human body by pharmacological, immunological or metabolic means, but which may be assisted in its function by such means. An accessory is defined as an article which while not being a device is intended specifically by its manufacturer to be used together with a device to enable it to be used in accordance with the use of the device intended by the manufacturer of the device. Keystone Compliance assists medical device manufacturers with EMC and environmental compliance. Please contact us for more information on how Keystone Compliance can assist you with identifying and fulfilling your needs.